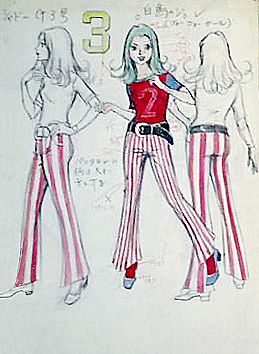 One of the original Japanese model sheets for Jun (Princess). This sheet contains preliminary information, the most noticeable of which is the number "2" present on her shirt, indicating her original placement within the Ninja Team. The upper left of the sheet reads: "Shadow G-3. "The upper right of the sheet reads "Jun, the Swan" followed by " Go-Go- Girl." The note at the center of the sheet reads "Stripes on pants get wider towards the bottom."